Jo Ann graduated from The University of Queensland. She enjoys doing general and aesthetic dentistry. Her passion is people — she is very friendly and easy to approach with her enthusiastic personality. She enjoys having good conversations with her patients and making them feel at ease. Outside of work, Jo Ann maintains an active lifestyle rock climbing and travelling — especially snowboarding in Japan and New Zealand. 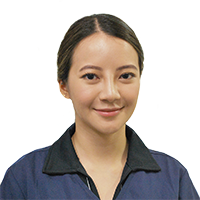 She also has a special interest in learning new languages and can speak Malay, Mandarin, Cantonese, and Japanese.